Lucania. Thurium. c. 433-400 BC. Stater, 7.65gg. (5h). 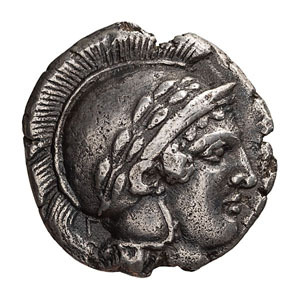 Obv: Head of Athena right, wearing wreathed Attic helmet, Γ behind neck-guard. 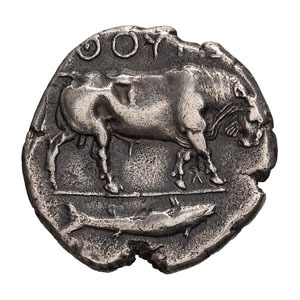 Rx: ΘΟΥ[ΡΙΩΝ] Bull walking right, fish right in exergue. HN Italy 1759. SNG ANS 931-933 (same obv. die). Toned aEF. Ex Philip T. Ashton Collection. Ex Pegasi 30, May 2014, lot 25; with ticket recording purchase from Baldwin's in March 1976.